One week; three pieces of good news! 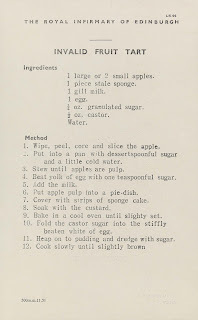 Our recipe for invalid fruit tart featured on the Great British Bake Off this Tuesday. We had originally submitted it to the Scottish Council on Archives awareness campaign, the Edible Archive, last year and it caught the eye of the producers of the show. There was obviously quite a bit of interest in the tart following its debut TV appearance as it trended on Twitter that evening. 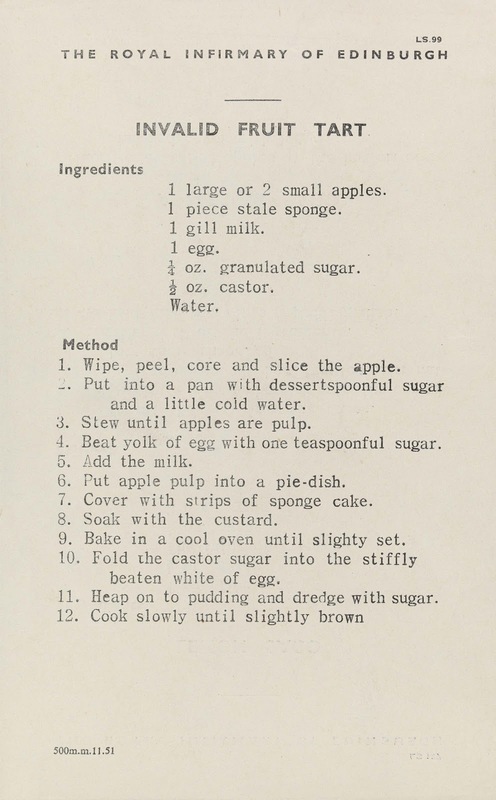 For those of you that might be tempted to try the recipe below, I can confirm that it is really very tasty having sampled it at an Edible Archive event! For more information please see the special addition to our home page this week, and there's still time to catch the programme on iplayer: http://www.bbc.co.uk/iplayer/episode/b01mg53s/The_Great_British_Bake_Off_Series_3_Episode_3/. We're delighted to welcome Louise Williams to our team; she will start work on our Wellcome Trust funded project to catalogue our extensive collection of Norman Dott case notes next Monday (for more information please see our project page). This week’s blog comes from Sara Cranston, the Edinburgh University Records Management trainee, who spent last week on a volunteer placement with us at LHSA. 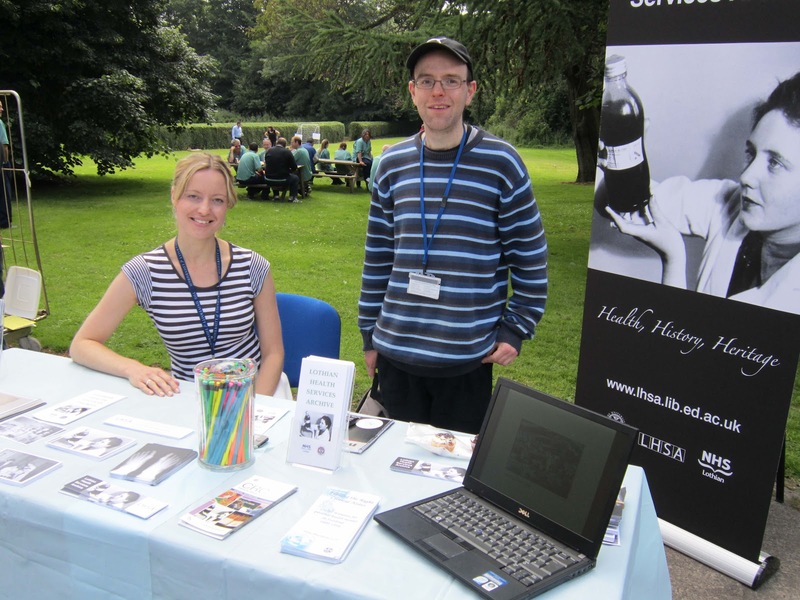 “I have been visiting LHSA this week to get an insight into the world of archiving. 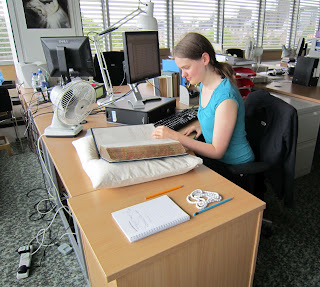 My main tasks have been working on the on-going volunteer project to index the case books of the Royal Edinburgh Hospital, and cataloguing some NHS staff newsletters. My task with the Royal Edinburgh Hospital casebooks has been to input details of each patient to create an index for each admission. When this is finished it will be much easier to locate records of individuals in the Case Books, which should be of great help to family historians and researchers. Although I believe there are still around 20,000 patient records to input. I have found these Case Books really fascinating. The volume I have been working on dates from 1878 – 1879 and contains remarkably detailed information about each patient. It definitely makes me want to find out more about nineteenth century perceptions and approaches to mental illness. Some of the pressures felt by the patients admitted to the Hospital are ones still present in society today. For example the causes of some patients’ illnesses are attributed to stress over lack of work, grief over the death of a loved one, and even the result of banking crises. One patient is a metal merchant who stops speaking due to ‘mental anxiety’ after losing all his money due to the collapse of Glasgow City Bank. Others are admitted after drinking bouts, or more physically manifest symptoms such as epileptic fits. As well as this, I have been organising copies of the Messenger internal staff newsletter of the Lothian University Hospital NHS Trust into acid free folders, and cataloguing them. These are much more modern documents dating from between 1999 and 2003. My instinct would be to think that an internal staff newsletter probably wouldn’t be that interesting, but from reading the headlines as I catalogued I notice they contain lots of information and opinions about the changes taking place in the NHS and document the move of the Royal Infirmary out to Little France. 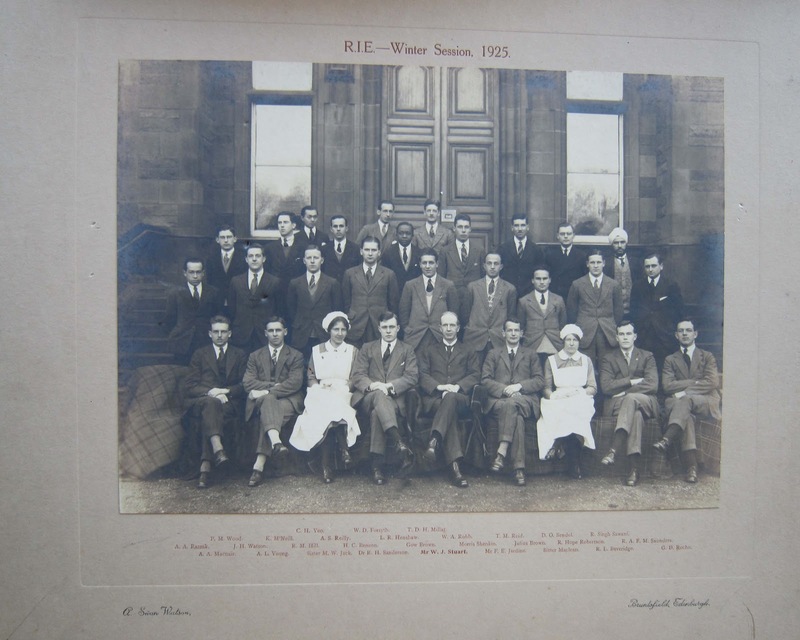 An excellent run of photographs in LHSA’s collection is that of the Royal Infirmary of Edinburgh Residents, of which there is almost a complete set from 1880 – 1973, with a number of older and more recent photographs (the oldest dates from 1865). These are an excellent source of images of famous medical staff during their training in Edinburgh. The collection as a whole is fascinating to look at, not only for finding famous individuals or ancestors; but for charting changing styles of dress and appearance, spotting the appearance of women from the 1940s onwards (although the first female resident was appointed in 1920), men in service uniform during the war years, and the odd residency pet! A similar series of photographs, which is not so well represented, is that of the Cliniques. 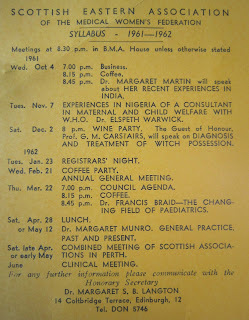 In these classes, a number of Edinburgh practitioners taught smaller groups of medical students in their specialisms. A gift of two photographs recently accessioned by LHSA (Acc 12/032) has helped to fill some of the gaps. 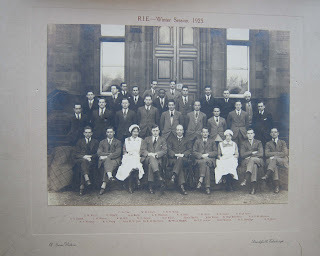 The photographs show the Cliniques of Mr WJ Stuart in Winter 1925, and Dr Edwin Matthew in Spring 1926. As well as digital images of the Hospital’s Royal Charter (find out more about the Charter on our website), we took postcards and leaflets to help spread the word about LHSA’s collections and services. We also had a laptop with a slideshow illustrating the Hospital’s long history (it celebrates its bicentenary next June). It’s been a lovely sunny day in Edinburgh and there was a good turnout for the event. 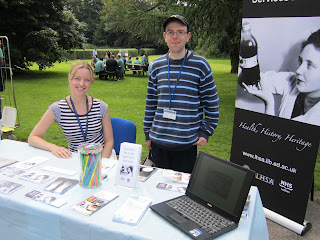 As well as LHSA’s stall, there were many others promoting the work of the Hospital and associated charities and groups. There was also plenty of home grown or baked produce for sale, including vegetables from the Hospital’s grounds. Cupcakes from a fellow stall-holder kept us going, and a win on the tombola saw us bringing back a box of goodies to share with colleagues in the Main Library! It was great to be involved in activity at the heart of the Hospital - the fete was attended by patients and staff along with members of the public. There was a fantastic atmosphere, lots of interest in our stall, and we’re looking forward to going again this time next year! We have been lucky to receive the papers of the MWF: SEB, dating from approximately 1917 – 2006 (Acc 12/030). The collection contains Advisory Council Papers, minutes, syllabus cards, financial papers, correspondence, campaign papers, newspaper clippings, and MWF historical papers. They are therefore a rich and comprehensive source of information on this branch, part of the Scottish region of the MWF, a UK-wide organisation founded in 1917 with the intention of promoting female doctors, and women’s health. 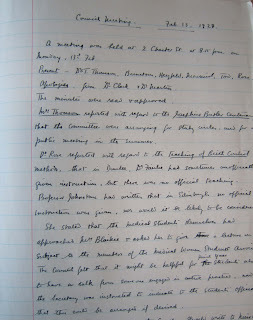 The minutes of MWF: SEB Council meetings from the 1920s and 1930s illustrate the breadth of areas in which these female doctors were engaged and reflect the concerns of the MWF at a national level: the scale of salaries for public health officials (especially with regard to equal pay), ante-natal care, work with other national organisations such as the British Medical Association, and birth control. The latter had become a contentious issue in the wake of Marie Stopes’ work and the minutes of February 1928 indicate that the members of the Medical Women’s Students Association had asked the MWF for a lecture on the subject as there was no official teaching. The Council reflected that it “might be helpful for the Final Year students also to have a talk from someone engaged in active practice”; presumably they meant from a doctor engaged in prescribing birth control, rather than using it! 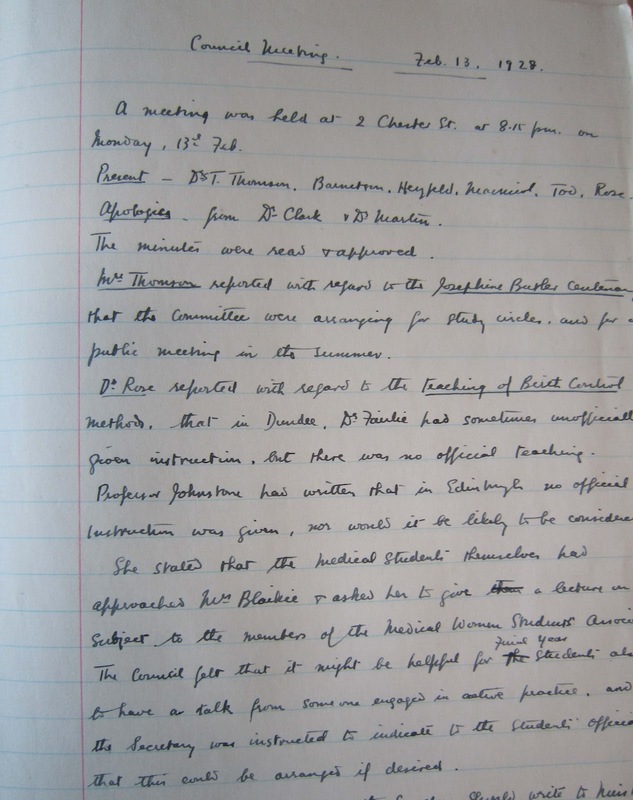 As well as their campaigning and education focus, the branch produced an annual syllabus; monthly meetings with speakers which also served as social functions. 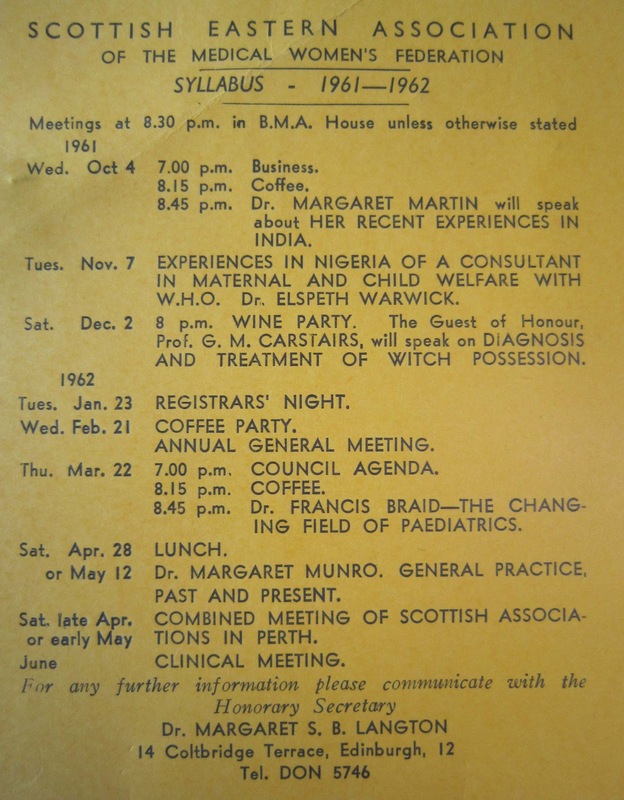 Together these records show the interconnectedness of many Scottish doctors, their interests and associations, valuable information for researchers. The accession will complement existing collections relating to eminent Edinburgh-based female doctors, such as Helen Millar Lowe , whose names appear within the records as active members of the MWF: SEB.